A BAG WITH A TV? Yes, if you're a couch potato and can't get enough of your home theater, this bag is for you. I was thinking at first if it's only cellphones and cars where you can built-in a monitor, well, quote me wrong ... this time it can be your purse. Perfect for ladies who are always on the road but need to see their favorite TV show. 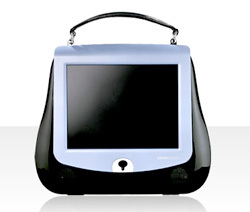 Don’t miss a TV show with the built-in TV in this purse. Using 100% genuine Italian leather, this purse by HannSpree looks ultra-hip. Perfect as a gift as I am sure most women will love this. Features a 9.6 inch screen with 800×600 resolution. More information available at HannSpree. na bilabi naman sad...mau ni sa mga adik sa tv...ehhehehe!